The largest Greek temple ever built, the Temple of Hera was one of the essential sanctuaries of ancient Greece, and is now a great sightseeing attraction. It was built near the mouth of the Imvrasos river for worship of the goddess who, according to myth, was born and lived there. Only half of one of its 115 columns stands today, but the bases of the columns and other temple foundations are still visible so it is possible to imagine what the giant temple looked like. The Temple of Hera was constructed over a long period of time - or rather, it was added to, renovated or completely rebuilt a number of times over the centuries when it was destroyed by earthquakes or other means. The oldest building phase identified by archaeologists is the 8th century BC. 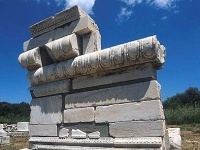 The very large temple, the ruins of which we can see today, was known as the 'Polycrates Temple'. One of the giant statues from this site can still be seen in the Samos Archaeological Museum, which is a good complement to a trip to the temple ruins as it provides context and information. Unlike many other archaeological sites in Greece, however, there is some information given at the temple and visitors receive a free guide leaflet upon entry. This temple is not to be confused with the Temple of Hera at Olympus where the Olympic Flame is lit for each Olympic Games.